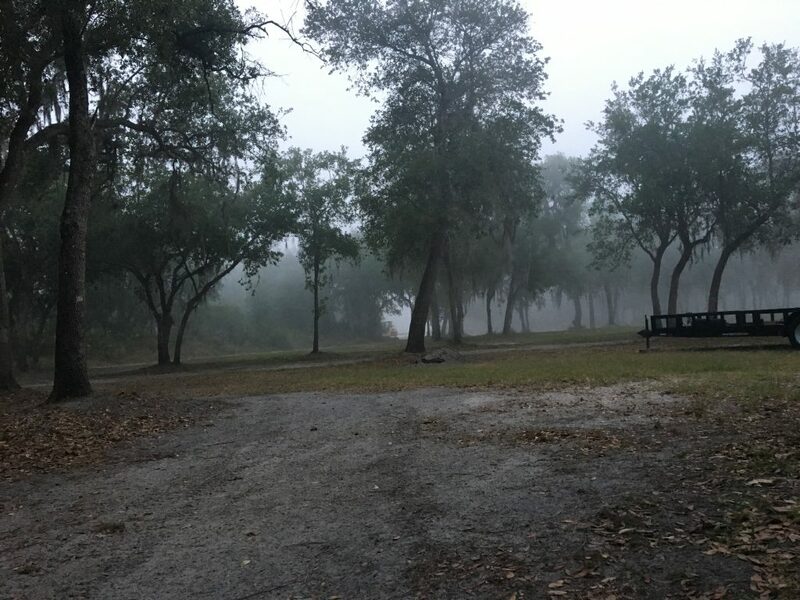 This morning was cool, calm and eerily foggy when I woke up at 6:30. I took my time breaking down my camp to give the sun a chance to burn some of it off and made myself a nice breakfast of avocado smeared on a bagel. Somehow, even though I hung my bag from a tree, a whole crap ton of ants got into my bagel bag and were having themselves a little ant party. Not one to waste my precious bagels I just took them out, blew most of the ants off and ate them anyways. Gross? Maybe. But little extra protein never hurt anyone! Those little ants died for a noble cause: propelling James and his Bike to their next destination! The first few miles of today’s ride were amazing! It was cool, the road was deserted and their was still enough fog left to lend the morning a surreal, movie-like quality. I was traveling through endless miles of citrus groves and although the orange blossoms weren’t in bloom there was still this faint hint of orange peel in the air, it was magical. I stopped in at a gas station at about the 20 mile mark to get me an ice cold can of my favorite leg fuel, Mountain Dew. As I was walking in the door this guy was coming out and said, “Damn, son! I must have saw you riding about 10 miles back and you’re here already!? What kind of mileage you get on that thing?” Without missing a beat I said, “Oh, you know, about 8 miles per pickle. Sometimes 10 if it’s a big one!” Ol’ boy about died laughing at that one. He asked me where I was coming from and when I said I started in Virginia his eyes got all big and he said, “Dammnnn! That’s a lot of pickles!” You’ve no idea, friend. The next 20 or so miles was on the same kind of quiet country roads as the last 20. The day had begun to get progressively warmer and I was sweating up a storm, but, learning from yesterdays mistakes, I had made sure to top my bottles up with ice cold water. Putting long hours in the saddle starts to mess with your mind after a while, your thoughts kind of drift here and there and everywhere like they do at that juncture between being awake and falling asleep. It’s very zen. During one of these meandering walks through the weird reaches of my brain I decided that my legs were like pickle powered pedaling pistons, say that 10 times fast. As soon as that thought popped into my head I got this monstrous hankering for a pickle, my mouth started watering uncontrollably thinking about that tart, jaw clenching, salty goodness. I stopped in at the next store I passed and bought a sandwich and three huge pickles, the kind that come in the little bag with the juices and all. 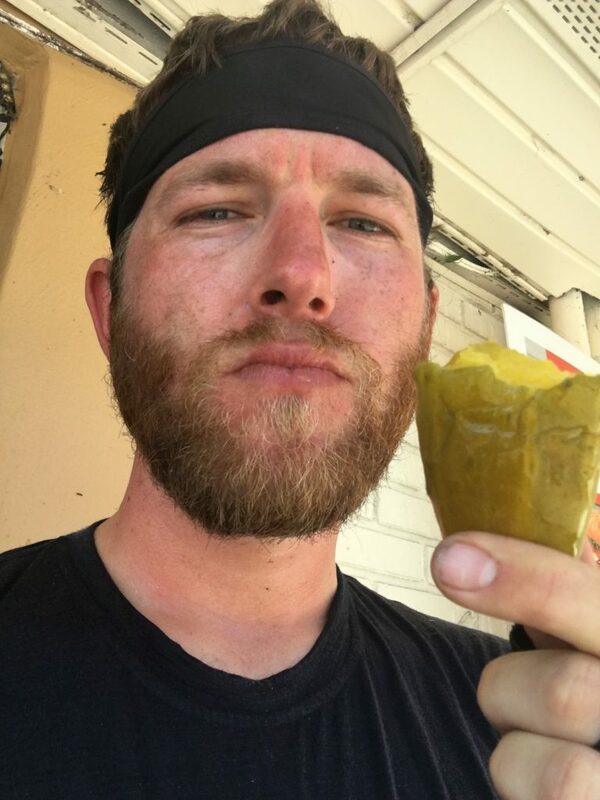 I’m sure the innocent bystanders in the area were pretty alarmed to see this giant, sweaty cyclist shoveling pickle after pickle into his mouth and then drinking every last drop of juice. I may have a problem… Oh, and I saw a sign for gatorade that said, “Florida Born Hydration” and it hit me. GATOR (as in University of Florida Gators) -ADE! The world makes sense now. I knocked out the remaining 25 miles with relative ease. It was really hot, and all that salty pickle juice made me thirstier than ever, but I made it. 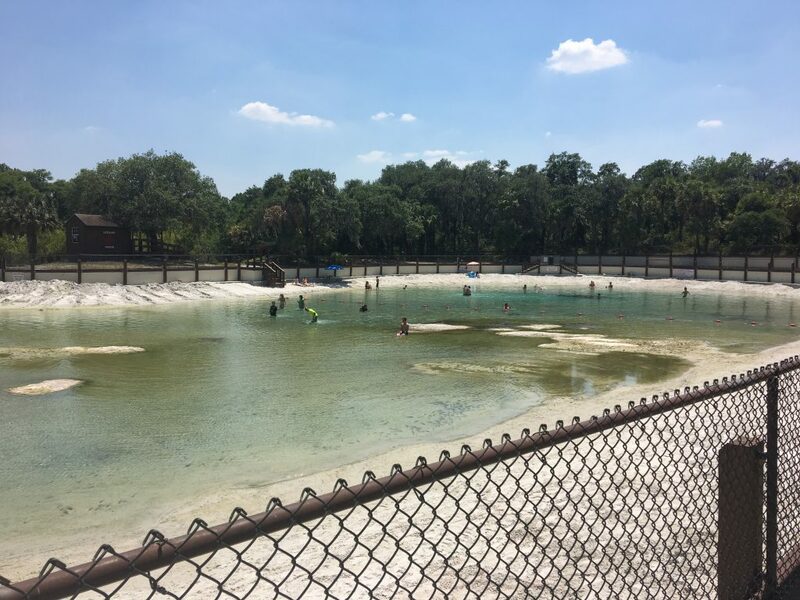 I’m staying at Lithia Springs Park and, as the name implies, it has this really awesome natural spring that you can swim in. The water stays at a cool 74 degrees year round and it was the most amazing feeling ever to jump in and cool off after this sweltering hot day. And to top this whole awesome day off I got a little surprise from my camp neighbors, Donna and Allan. They had come over while I was setting up my tent and were asking about my trip and told me if I needed any of the comforts of home to just come knock on their RV and they’d be more than happy to help a guy out. Well when I came back from swimming in the spring I noticed a cooler sitting by my picnic table. It was completely filled with ice and had a few sodas and water tucked in as well. Seriously, who’s that nice?! They are. Thanks, friends!!! Well that wraps it up for today. 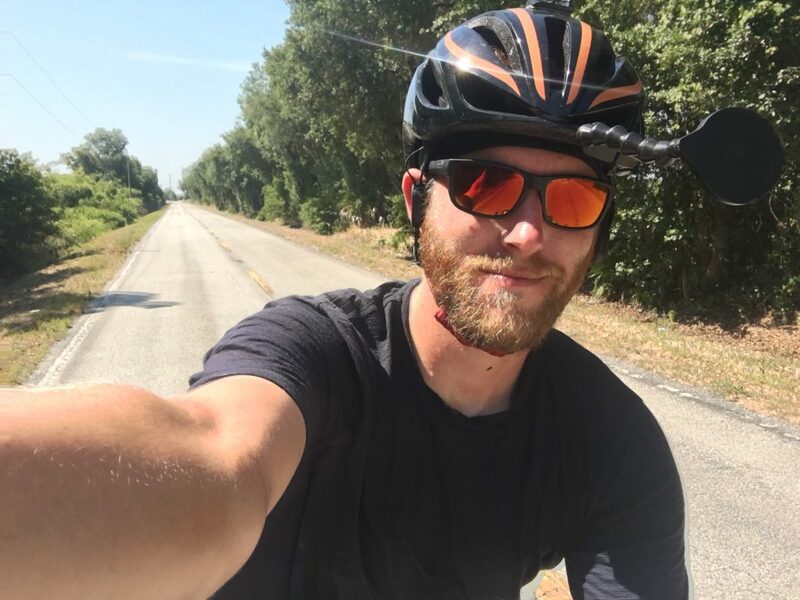 I’m going to try and convince a pizza joint to deliver to my campsite 🙂 Stay tuned for the next edition of James and his Bike! These campers are SO nice! I love that! ❤ Thanks guys! ?
? 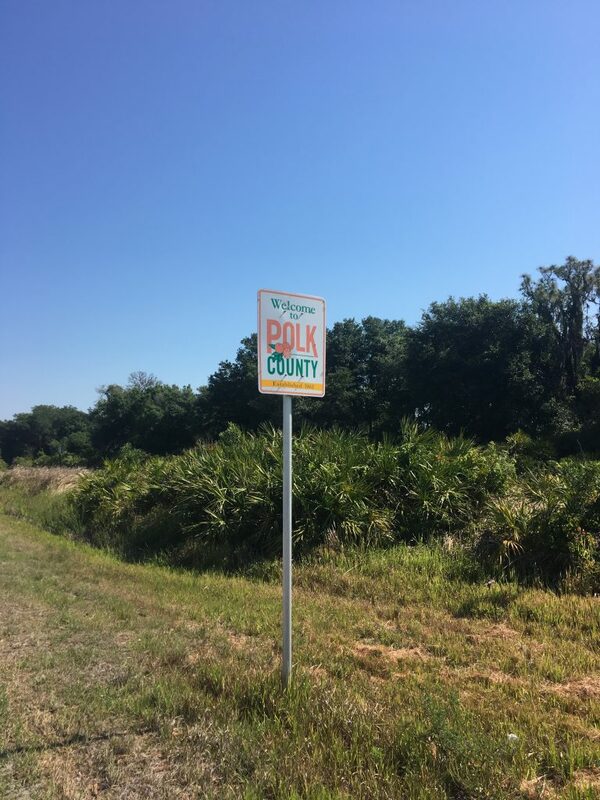 Polk County people ❤️ you!! !